Few authors have made an impact as enduring as literary icon Samuel Clemens, a man who, under his pen name, Mark Twain, wrote such classics as Adventures of Huckleberry Finn, a book which has been read by many millions of people around the world since its publication in 1884. It was ten years earlier, whilst shopping in Boston, that a curious Clemens spotted and then bought a Remington No.1, the very first “type writer” to be produced by E. Remington and Sons, released to the public that year. 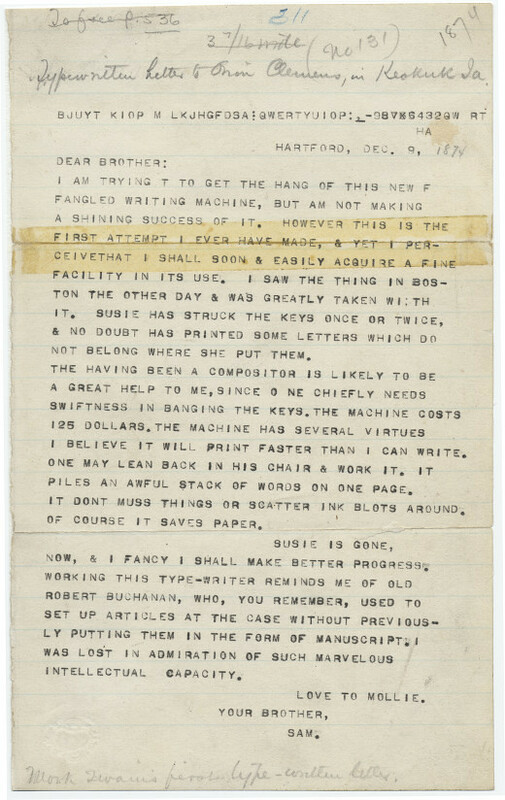 The first letter he wrote on his “new fangled writing machine”--which, incidentally, could only produce upper-case characters--was to his brother, Orion. Nine years after this letter was typed, Twain became the first author to deliver a typewritten manuscript to a publisher. It was his memoir, Life on the Mississippi. Letter taken from the More Letters of Note book. For more info and to read reviews of that book, go here. Image courtesy of Vassar College; reproduced with permission of the Mark Twain Project. I AM TRYING T TO GET THE HANG OF THIS NEW F FANGLED WRITING MACHINE, BUT AM NOT MAKING A SHINING SUCCESS OF IT. HOWEVER THIS IS THE FIRST ATTEMPT I EVER HAVE MADE, & YET I PERCEIVETHAT I SHALL SOON & EASILY ACQUIRE A FINE FACILITY IN ITS USE. I SAW THE THING IN BOSTON THE OTHER DAY & WAS GREATLY TAKEN WI:TH IT. SUSIE HAS STRUCK THE KEYS ONCE OR TWICE, & NO DOUBT HAS PRINTED SOME LETTERS WHICH DO NOT BELONG WHERE SHE PUT THEM. THE HAVING BEEN A COMPOSITOR IS LIKELY TO BE A GREAT HELP TO ME, SINCE O NE CHIEFLY NEEDS SWIFTNESS IN BANGING THE KEYS. THE MACHINE COSTS 125 DOLLARS. THE MACHINE HAS SEVERAL VIRTUES I BELIEVE IT WILL PRINT FASTER THAN I CAN WRITE. ONE MAY LEAN BACK IN HIS CHAIR & WORK IT. IT PILES AN AWFUL STACK OF WORDS ON ONE PAGE. IT DONT MUSS THINGS OR SCATTER INK BLOTS AROUND. OF COURSE IT SAVES PAPER. SUSIE IS GONE, NOW, & I FANCY I SHALL MAKE BETTER PROGRESS. WORKING THIS TYPE-WRITER REMINDS ME OF OLD ROBERT BUCHANAN, WHO, YOU REMEMBER, USED TO SET UP ARTICLES AT THE CASE WITHOUT PREVIOUSLY PUTTING THEM IN THE FORM OF MANUSCRIPT. I WAS LOST IN ADMIRATION OF SUCH MARVELOUS INTELLECTUAL CAPACITY.